Actually, there are many cases when you want to wipe out an Android phone. 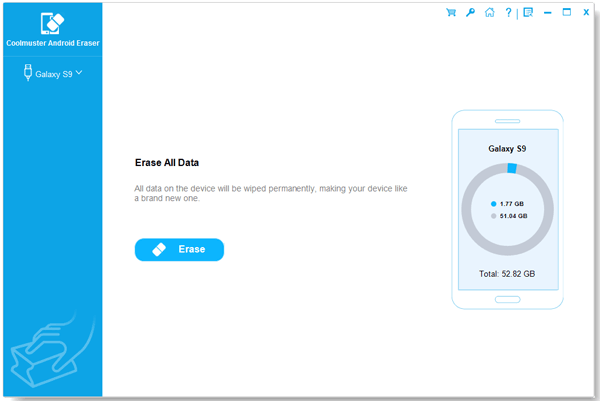 For example, when you want to sell out your old Android phone for a new device, when you want to permanently erase all data containing your personal information, you could now want to wipe out an Android phone. So how can you do that? After all, simply deleting files within the device can do nothing. Here, you can consider relying on this Android Data Eraser software to permanently wipe an Android phone. With this software, you can easily erase all files from Android phone within simple clicks, including contacts, messages, videos, photos, movies, apps and many more. And files deleted with this software will have no chance of getting recovered. As to the user interface, this software offers you the easiest way to wipe out any data within simple clicks. And all Android devices can be fully supported with this software! Below are the free trial versions of this software. You can download the right one to give it a try by yourself! First of all, open the installed software on the computer and then get your Android phone connected to the computer via the USB cord. 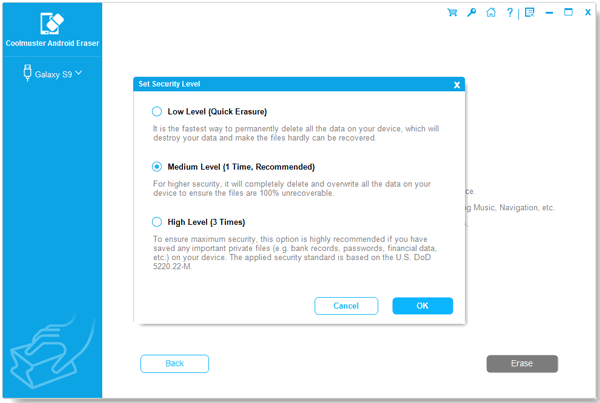 Then this software will detect your device and detect all file folders on the main interface. Choose the right erasing mode and erasing level to continue the process. Then, all the files will be detected by this software and all files will be arranged on the main interface. You can now enter the right file tab to preview more detailed file information. While previewing, select the wanted files by ticking them out. Finally, hit the Erase option to permanently wipe Android phone. Now, you can simply wait for the process to get completed within a little while. With this Android Data Eraser software, it is just a piece of cake to erase data from Android phone once and for all!